I decided to try one of those "artisan breads" so many people are talking about. I kinda wanted to keep pressing my skills and see how far it will stretch, ya know? After a bit of searching, I came to an Italian Ciabatta. I'm doing a pasta dinner for some out-of-town friends tomorrow night, and I wanted to find something that fit, but would also be impressive, too. It's kind of interesting. It's a very wet dough and it's got a very long pre-ferment time. In fact, it was very tricky for me to figure out exactly when to set it up and when to start so that the times of activity (mixing, kneading, baking) and the times of inactivity (rising, proofing, etc...) would all co-incide with times that I'd be able to do them. I haven't tasted the end result yet. It looks good, but the crumb is more dense than the pictures in the book I used (The Art Of Bread (Cooking Arts Collection) ). The pictures show a lot of large bubble holes, and a strong crust, but I got a very light crust and kind of normal crumb. Perhaps someone with more expertise in bread making can point out where I went wrong. Still, it smells great, and I think it will taste great tomorrow, too. Of course, I had to make some adjustments to the procedure to adapt to outdoor cooking in the dutch oven. I think this process needs more tweaking. I started early yesterday morning, very early, when I got up and made the "Starter". So many different books call this step so many different things. Some call it the pre-ferment. Others call it the start or the starter. I've heard it called the sponge. I don't know what to call it. But at any rate, I combined the water and the milk, then dissolved the yeast into that mixture, letting it sit for about 5-10 minutes. Then I added the honey. Finally, I stirred in the flour. It was pretty runny and sticky, for dough. I set this aside on my kitchen counter, covered by a cloth towel. About 12 hours later, (according to the instructions in the recipe), I looked at it. In fact, I'd been checking on it along the way, except for the hours we were out swimming as a family. Fun stuff, bad sunburn, the usual. It had foamed up and sank back down. I hope that was what it was supposed to do. Next I added two cups of flour and kept stirring. According to the instructions, it should remain very sticky and quite loose, not like a good, firm, kneadable dough. I could see that the stirring up time was the only kneading it was gonna get. It was very difficult, and tiring to the ol' wrist, to stir it all over and over for 6-7 minutes. I had to do it, though, so I did. I pulled it out for a moment, and sprayed the inside of the bowl with Pam spray, and then put it all back in. I set it aside with a towel over it, and let it rise for another 2 1/2 to 3 hours. At about 2 to 2 1/2 hours rising time, I started some coals. I checked, of course, and it had risen a LOT! The recipe said to let it rise to triple it's original size, and it had certainly done that. The next set of instructions were a little unclear in the book, and even less clear as to how to translate them into the dutch oven. The idea is to handle the dough as little as possible so as to not degass it. While I was contemplating that process, I got some lit coals out on the lid, pre-heating it. I essentially put all the coals listed above on the lid. Finally, I made a decision. I sprayed the inside of the dutch oven, and then, as gently as I could, upended the bowl into the dutch oven. It did degas some. I'm not sure how else to do it. I let it proof in the dutch oven for another 20 minutes or so, while the lid got good and hot. Then, I sprinkled the dough with flour, primarily just as a topping, to pretty it up. Anyway, when the thermometer read done, I pulled it out and let it cool. Then, I sliced it open and put it away in the fridge for Monday night. We'll see how it goes! This last Saturday was my birthday Dutch Oven Gathering. I almost canceled it, because I didn't have many respondents. But in the end, we did it anyway. Only my good friend Andy was able to make it for some great outdoor cooking. We did move it from the park to my house, and that was cool, except that Andy had a really hard time finding my house. Eagle Mountain is not the easiest city to navigate. We both cooked up some good stuff. I made some bread, and this honey mustard salmon crusty thing, that I'll write up later this week, and Andy made what he calls "Mushrooms Bellagio". I was blown away by it. It was essentially a stuffed mushroom dish, but it was totally different from all the other variations I've ever seen, in indoor or outdoor cooking. First of all, there wasn't any cream cheese in the stuffing, second, it was all topped and blended with a marinara sauce! That alone turned it from a simple appetizer to a main dish. In my mind, I'm thinking it would be really cool on top of a plate of hand- rolled fettuccine! The 'shrooms would replace meatballs in the sauce! Light the coals, and as they heat combine the precooked sausage, 1/2 the Asiago and all the spices. I mixed them in a ziplock bag to save on dishes. Stuff the sausage mixture into the mushrooms where the stems were. Layer them crown down in a 12" Deep Dutch Oven. Top each layer with the remaining Asiago, and pour any remaining sausage mix on the top. Cover with the lid and heat until the mushrooms are soft and the cheese is melted. You may need to baste out some of the juices, and can save that as a mushroom gravy if desired. I found a large water syringe works well as a turkey baster if one can't be found... in fact, I'm going to nab the next one I find for my outdoor kitchen! Add the marinara and cook until the sauce is bubbling. Serve immediately. Thanks, Andy! He's a great iron chef. It was wonderful to sit with him and talk about music and things, while the food was cooking down. Go check out his songs at his facebook page. Oh! And I almost forgot! He gave me a wonderful birthday present: The Magic Dutch Oven Spoon! It's a big, wide, wooden spoon, and he's etched the heat/coals chart into the back! So, whenever I'm out cooking, and I need a heat guide: I can consult the Magic Spoon! Ingenious! Here's a shot of the Salmon. There'll be more on this one when I write it up in full recipe form on the blog. I cooked it a second time the next day for my parents and sister/bro-in-law. It's really good! 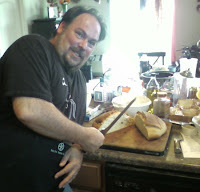 Mark: Master bread maker or psycho killer with a knife. You decide, and comment below. Here's the magic spoon. Apparently, even though I aligned the picture correctly, it's not magic enough to display that way. I guess you just have to turn your head. Still it's invention is sheer genius! As I was checking around my blog, I noticed a link back from a blog called "Too Many Hobbies, Too Little Time." I've actually followed this blog for a while. I can relate to the title. Anyway, he'd linked to my sourdough bread page, and I checked his post out, and found instructions for making bread in the outdoors. Now, when I do my bread, I knead it, raise it, and prep it all indoors, and cook it on my back porch. I've wanted to figure out how to do it in the great outdoors, so I was glad to find this. I will try it soon, and see what we find. OK, so I'm trying to figure out how to use chiles in my outdoor cooking. It seems to me that you can never fully tell just how hot something's going to be just by how many jalapeňos you add, right? I mean, the actual hotness varies, it seems. I put in one chile one day, and wow! It's way too hot, another day I put in three and it barely tickles. What's up with that? OK, I'm exaggerating. A little. Still, I'm struggling, here. He'p me out! I do know that cutting out the seeds and the veins that are inside of a chile pepper will make it much less hot. John over at Mormon Foodie, wrote a cool post about dried chilis. Good stuff. The reason I bring all this up, is because I revisited an old favorite recipe the other day, one that I pulled from my outdoor cooking archive. Dutch Oven Chile Verde. I had eaten a smothered burrito at a small mom-n-pop Mexican place a few weeks back that was hotter than that one hot place that good Mormon boys aren't supposed to say. I swear this burrito bit me back. Man, it was good! I kinda wanted to duplicate that sensation. But I failed miserably. I think it had a lot to do with the knowledge that my kids don't handle hot very well, and I knew that if it was a "3-alarmer", they wouldn't even touch it. So, I did back off a bit. But it also turned out that I backed off too much. It was pretty weak. Still, the family liked it, so I guess that's OK, right? I also did some black beans in my 10", and some rice in my 8" dutch ovens. The whole process started the night before, when I took out a half pound of black beans and set them in a bowl to soak. The next day, when cookin' time came, I started up some coals and got the onions and garlic chopped while they were getting ready. I put the oil in the dutch oven, and got it good and hot. I've learned that's the secret to sauteeing. It's gotta be hot first. 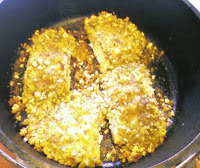 I don't remember exactly how or when, but somewhere in all that, I changed the water on the beans, put them in my 10" dutch oven and put that on a lot of coals as well. I put the lid on and let that simmer and cook, adding coals all the while to keep it hot. While that was going on, I got the tomatillos chopped and added them as well, with the chicken stock (which was stock that I made myself in my own dutch oven!). Once the tomatillos and the chicken stock was in, I put on the lid, and the rest of the time it cooked lid on, with only bottom heat. Here's where what I actually did diverges from what I'm telling you I would do next time. Next time, I'd start by slicing up the anaheims and just adding them in, without de-seeding them. Then, I'd probably add one jalapeňo, also sliced, also without seeding, and I'd let that cook for about a half hour. While that was going on, I'd add all the herbs and spices in the next ingredient group. Much of the spices and herbs are being added, not so much by measure, but more by taste, by the way. Then, after about a half hour, I'd taste it and see if it were hot enough. If so, great, just let it keep cookin'. If not, I'd add another jalapeňo, and let it cook for another half hour. I'd keep going like that until it was just as hot as I'd like it. Then, once it's hot enough, I'd let it simmer for about another half hour or so. At that point, I'm back to where I was on Sunday. I set up my little 8" with a cup of rice and 2 cups of water, and put that on some coals to boil. This was also done with the lid on, and only bottom heat. I kept checking on the beans, and they were done right (with a bit of salt) and ready to go. Mark has discovered a love of Dutch Oven Outdoor Cooking. Mark also has other sites and blogs, including MarkHansenMusic.com and his MoBoy blog. In the last few days, I've done a couple of recipes I've done before. So, it was nothing new, but any chance I get for some outdoor cooking, I'm going to go for. We did some changeups, though, and in some cases that helped and in others it didn't. The first was lasagne in my 12" dutch oven. One thing I did that I think worked really well was to sautee the onions and the garlic after browning the sausage, using some of the sausage drippings. After those were done, we mixed them in with the sauce. Another change which I didn't think would be that big of a deal (but turned out to make a big difference) was forgetting to start the stack with sauce. I started with noodles on the bottom. Since the noodles start uncooked, there was little moisture at the bottom to cook that lowest layer of noodle. They were tough and chewy, almost like they were fried. Not good. The rest of the stack tasted great, though. So, I learned my lesson. Start with the sauce! Then, yesterday, my son convinced me to make pizza with him. 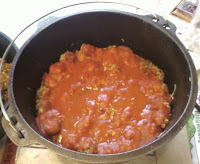 As we worked on it (he on the sauce, I on the crust), we decided to use the dutch ovens. The only changeups we did were because we didn't have the right toppings. I'd used all the sausage and the mozarella for the lasagne, so we just had pepperoni and ham, and we used cheddar jack for the cheese. Outdoor cooking with your kids is just soo much fun. Now, I've read that doing an overnight, refrigerated rise on pizza dough makes it taste great. I've never done that because we always seem to do pizza on impulse. One of these days I'll try it.